As if you needed more incentive, after you’ve finished writing your novel, the program will allow you to easily compile all the chapters into a manuscript ready for intense editing, printing, or distribution. The first time you launch LSBXE, you will be overwhelmed; that’s pretty much a given. But once you ease into it, you’ll find it to be incredibly flexible. What you need to keep somewhere in your mind is that you can start writing right away while learning to use additional features and tools little by little as your need arises. I repeat, you do not need to use every one of LSBXE’s features from moment one. In fact, that’s why this little tutorial came into being. It is the bare minimum to get you writing your NaNoWriMo novel with a few helpful tips. I hope you find it useful and helpful. To start off with some semblance of organization, you’ll want to create a brand new book. You’d be wise to name this book NaNoWriMo. 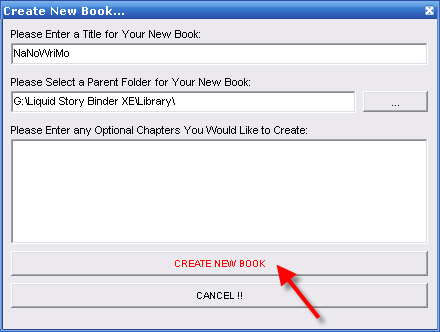 Creating a new book is simple: Select “Library » Create New Book” from the menu. This new book should automatically open when you’re done. When the box opens up, type the name and you’re done. Tip: Avoid typing any chapter titles in your book when you’re creating it. Use the planner which you’ll learn about in the next step for this. 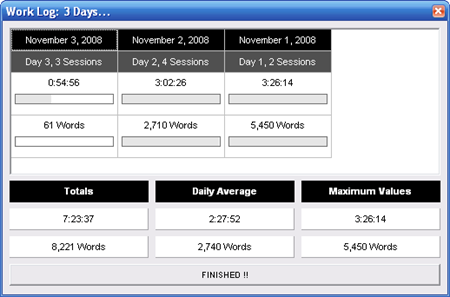 In keeping with the goal of organization, your next step is to create a planner for your current NaNoWriMo novel. You can name this planner after your novel if you already have a name or use something ambiguous. 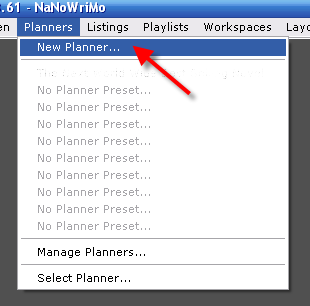 To create a new planner, select “Planners » New Planner” from the menu. Your new planner window should automatically open. When the window opens up, type the name of your novel. Tip: Make sure to include the year in the planner title. This is helpful if you intend to participate in NaNoWriMo next year and in the future. It simply becomes a matter of adding a new planner for each year’s novel. The hard part is done, now it’s time to start writing your novel. The beauty of using a planner is that you can write nonlinearly. With a traditional word processor, such as MS Word, you write in one straight line. If you want to skip to another scene, you’ll need to remember where the giant gap is in the document to fill it in later. Not exactly the best for sanity. Using a planner in LSBXE allows you to write your story as individual chapters or scenes which can later be easily rearranged. Adding new items to your planner is as simple as clicking the third icon down from the top or choosing “Items » New Item” from the menu or hitting Ctrl+Ins on your keyboard. When the new item appears, it will just be a blank row. Give it a name and description using the boxes at the bottom. The top box is used for the name of the chapter (example: “Lovers Meet”) while the box below it is like a sub title (example: “The main character…”). Tip: Avoid using titles like “Chapter 1″ or “Part 1″, it may hamper your creativity and flexibility later if you wish to rearrange the order of your chapters. Instead, use descriptive names like “Lovers Meet” or “Dragon Battle” with the subtitle as a brief description of the action that takes place. To create a new chapter and start writing, double click on the planner item. It will ask you if you wish to create a new chapter, say yes, and you’re ready to start writing. Take some notes. Add a notepad for your novel by selecting “Create » New Note” from the menu. When the window opens up, type Year Novel Notes (replacing the word ‘year’ with the actual year of your novel). Use this notepad as a place to store your fleeting ideas and random dialog that doesn’t fit anywhere just yet. Reference it as needed. Characters from thin air. When you’re hung up on a character name, you can use the random character generator built into LSBXE. To get to it, select “Tools » Character Generator“. Play with this and have some fun, but don’t use it to procrastinate. Write. Leave yourself internal notes. Using the notepad feature is great for abstract ideas and thoughts that really don’t belong anywhere in any chapter just yet, or other things you need to remember, however, you can use notes within a chapter to mark content you need to fill in later or additional research you need to make. To create a line note, precede the paragraph with two periods (..). And don’t worry, line notes aren’t counted toward your word count totals. You can read more helpful tutorials at the Black Obelisk website or join the Yahoo! Group if you wish to ask questions directly. 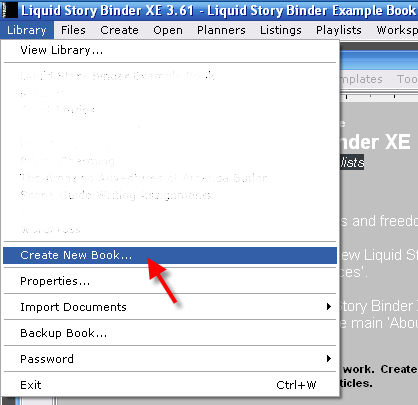 Liquid Story Binder XE is normally $45.95 (and is definitely worth it), however, it does come with a 30 day free trial which makes it perfect for the month long writing marathon.